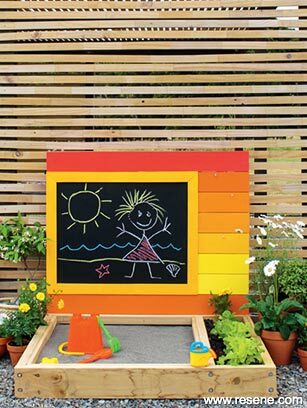 You will need: Wall framing: 6.4m – 90mm x 40mm treated pine, Slats: 4.5m – 115mm x 20mm pine, Blackboard frame: 3.5m – 60mm x 10mm pine, Sandpit frame: 5.4m – 140mm x 45mm dressed treated pine, sandpit edging & lid: 6m – 20mm x 45mm pine batten, Blackboard & lid: 1 sheet 12mm treated ply, weedmat, skillsaw, drop saw, filler & sandpaper, 22mm paddle bit, drill bits & drill, socket set, staple gun (optional), 8 x 33, 40 & 65 wood screws, 12 x M5 x 100 coach screws, 4 x M5 x 120 coach screws, 3 x cup hooks , primer, test pots & brushes, sand, potting mix. 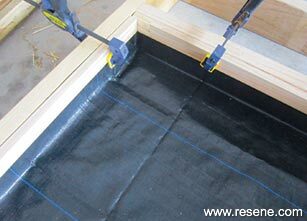 Cutting lists: Wall: 2 x 1200mm & 4 x 1000mm, slats: 2 x 1200mm & 6 x 300mm, blackboard: from the ply sheet 900mm x 710mm, blackboard frame: 2 x 900mm & 2 x 715mm with mitred corners, sandpit: 2 x 1200mm & 3 x 1000mm, Lid: from the ply sheet 925mm x 1080mm. Back wall: Using the 65mm screws, assemble the wall with the two internal struts centred at 300mm and 750mm in from right hand edge. 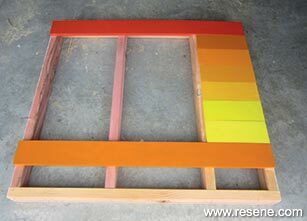 Fill the screw holes and undercoat the outside faces of the wall frame. 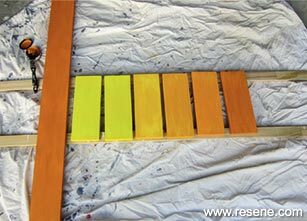 Undercoat slats with primer (I used Resene Quick Dry) and topcoat. I used the following Resene colours: Wild Thing, Buttercup, Turbo, Malarkey, Energise, Clockwork Orange and Whizz Bang. Starting from the top, attach one 1200mm slat level with the top of the wall and the second 140mm up from the base of the wall. Centre the remaining short slats between. Drill and countersink the holes, attach the slats then fill, sand and apply the second topcoat. Topcoat the outside faces of the wall frame (I used Whizz Bang). Undercoat and topcoat the blackboard with two coats of blackboard paint. Undercoat and topcoat the frame (I used Buttercup). Position the blackboard and frame and drill, countersink and screw to the wall framing. Fill the holes and apply the second topcoat. Sandpit: With the internal divider centred at 300mm from the right hand edge, use the paddle bit to a depth of 5mm, and the 7.5mm bit to create the coach screw holes. 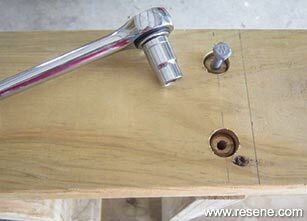 Use the 7mm bit to drill through the coach screw holes into the joining timber. 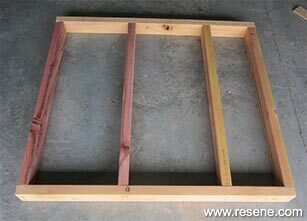 Assemble the sandpit using the coach screws and a socket set to tighten the screws so the heads are inset. Insert the weed mat, tidy the corners (the staple gun is handy here), cut and attach the batten around the top with the 32mm screws. 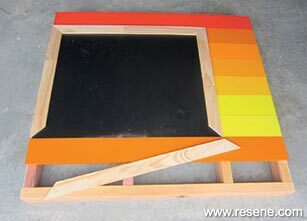 Place the sandpit and wall in position and attach the sandpit to the wall by insetting the heads using the paddle bit, and screw through the two central frames into the sandpit back wall. Cut and sand the lid. Undercoat and topcoat. 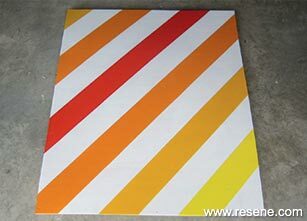 Add two strips of the batten on the underside of the lid to sit just inside the inside edge of the side battens. Add hooks for toys.